According to Ming Pao, the number of marchers will be counted by at least three parties: the Hong Kong police, the HKU Public Opinion Programme and the Civil Human Rights Front (at Victoria Park, Causeway Bay, Wanchai and Government Headquarters). (Associated Press via CNN) December 4, 2005. Posted 1901 HKT. Organizers said the protesters filled at least six soccer fields before the march began. Hong Kong's Cable TV estimated the turnout to be around 50,000. (Reuters) December 4, 2005. Posted 1748 HKT. Hong Kong's RTHK radio station estimated that 60,000 people had assembled in Victoria Park before the march snaked through skyscraper-lined streets, gathering more protesters and halting traffic, as it approached the city's government offices. (AFX) December 4, 2005. Posted 1921 HKT. Initial estimates from organizers put turnout at Sunday's rally at about 70,000. Police figures were not immediately available. (Bloomberg) December 4, 2005. Posted 1721 HKT. An estimated 100,000 people joined today's march, local radio station RTHK said, citing Cheng Kar-foo, a Democratic Party lawmaker. An official police estimate wasn't immediately available. (DPA) December 4, 2005. No time stamp. An estimated 100,000 people took part in a pro-democracy march in Hong Kong this afternoon ... Organizers said it was too early to give a formal estimate of the turnout but believed around 100,000 people took part in the protest, exceeding early expectations. Fifteen minutes into the march, police put the crowd at 40,000. At least 100,000 people took to the streets to join a march in the heart of Hong Kong, calling for full democracy as stipulated in the territory’s mini-constitution accepted by China eight years ago, when the formal British colony passed under the rule of the People’s Republic, albeit maintaining its autonomy. (Ming Pao via Yahoo! News) December 4, 2005. 1925 HKT. (Translation) The pan-democrats said that the number of people who participated in the march exceeded 250,000, while the police said that the number of people who departed from Victoria Park at 3:10pm was about 40,000. (Ming Pao) December 4, 2005. 2017 HKT. (Translation) The end of the line of the marchers for universal suffrage reached government headquarters at 8pm. The police said that the total number of marchers was 63,000 but the organizers said it was more than 250,000. In the evening, the police issued a statement that the total number of marchers was 63,000. Earlier, they had stated that when the march began from Victoria Park at 3:10pm, there were 40,000 in the demonstration. (Financial Times) By Justin Lau. December 4, 2005. 2048 HKT. Hundreds of thousands of people marched through the heart of Hong Kong on the weekend to urge Beijing to introduce universal suffrage in the former British colony, in the biggest pro-democracy protest in the territory in more than two years. Organisers of the match claimed that more than 250,000 people, many of them dressed in black as requested, took to the streets to protest against government reforms that stopped short of a timetable for direct elections of the city’s chief executive and legislature. The figure is much higher than the original expectation of 50,000, although the police said there were only 63,000 people. (BBC News) By Chris Hogg. December 4, 2005. 2058 HKT. Tens of thousands of people have taken part in a march in Hong Kong to demand a fully democratic political system. The BBC's Chris Hogg in Hong Kong said the march appeared to be much larger than many had predicted, with many ordinary citizens and their families taking part. (Reuters) By John Ruwitch and Wendy Lim. December 4, 2005. 2103 HKT. Tens of thousands marched in Hong Kong on Sunday for the right to directly elect their leaders and to protest against a package of electoral reforms pushed by the city's chief executive and Beijing. With organizers putting the number of protesters at quarter of a million, the march could irritate China's Communist Party leaders and embarrass Hong Kong Chief Executive Donald Tsang. Police said 40,000 people gathered at the city's Victoria Park, but thousands more protesters wearing "Hong Kong loves democracy" stickers joined as the march snaked between skyscrapers to government offices. (Xinhua) December 4, 2005. 2125 HKT. 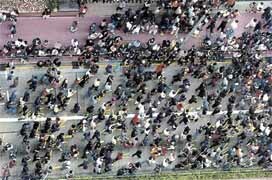 Thousands of Hong Kong citizens took to the streets in Hong Kong Island Sunday afternoon. 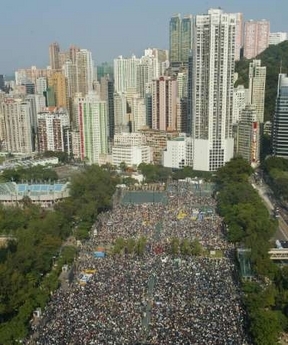 ... Hong Kong Police estimated the turnout to be around 63,000. (CBC) December 4, 2005. 2137 HKT. Tens of thousands of protesters marched through the centre of in Hong Kong on Sunday to demand full democracy in the former British territory that is now part of China. Organizers claimed more than 250,000 people took to the streets; many carried placards and dressed in black as requested. (Associated Press via CBC) By Willow Duttge. December 4, 2005. 2207 HKT. Tens of thousands of people marched through the streets of Hong Kong Sunday to protest the slow pace of democratic reforms, intensifying pressure on the government to speed up the movement toward full democracy. Organizers said about 250,000 people, with many clad in black, took part in the march - much higher than analysts' estimate of between 50,000 to 100,000. But police said they counted only 40,000 people when the march began in Hong Kong's Victoria Park. Many joined the rally along the way. (New York Times) By Keith Bradser. December 4, 2005. Organizers estimated the peaceful crowd at 250,000, while the police put it at 63,000. (Deutsche Presse Argentur) December 5, 2004. 0046 HKT. An estimated 250,000 protesters took part in a pro-democracy march in Hong Kong Sunday, calling on Beijing to allow free elections in the former British colony, organizers said. (Associated Press via CBC) By Helen Luk. December 5, 2005. 0052 HKT. Organizers said the massive protest drew 250,000 people - far exceeding analysts' forecast of between 50,000 and 100,000. But police put the turnout at 63,000. (The Standard) Cannix Yau and Wendy Leung . December 5, 2005. The larger-than-expected protest by tens of thousands of people in favor of accelerating the pace of electoral reforms represents a victory for Hong Kong's democratic camp and deals the first significant blow to Donald Tsang since he became chief executive in June. The message of Sunday's crowd, estimated by organizers at 250,000 and by some independent analysts at 100,000 or more, was clear. (Christian Science Monitor) By Robert Marquand. December 5, 2005. Reports that this city's democracy movement was dead appear to have been greatly exaggerated. An unexpected turnout of as many as 250,000 marchers here Sunday is a clear repudiation of pro-Beijing policies that would stall if not kill democratic aspirations in Hong Kong. ... The news wires of the official Xinhua news agency in Beijing did not have a Chinese-language report of the event, but an English-language version described "a few" protesters. Police stated that the number was only 63,000. (The Times) By Jane Macartney. December 5, 2005. Dressed in black and chanting “one man, one vote”, a quarter of a million people marched through Hong Kong yesterday to demand the full democracy promised when Britain handed back its former colony more than eight years ago. (Telegraph) By Richard Spencer. December 5, 2005. The most popular woman in Hong Kong joined around 250,000 people in a rally yesterday to call for full elections, putting new pressure on the government and its masters in Beijing. ... The numbers were estimated at a quarter of a million by organisers but at only 63,000 by the police. (Washington Post) By K.C. Ng. December 5, 2005. Organizers said more than a quarter-million people participated in Sunday's protest, which was intended to pressure the Chinese government and the man it picked to run Hong Kong, Chief Executive Donald Tsang, to modify a proposed package of limited political reforms. Police said about 63,000 participated in the protest. (The Independent) By Helen Luk. December 5, 2005. A quarter of a million protesters marched through Hong Kong yesterday to demand full democracy from their rulers in Beijing. (South China Morning Post) By Barclay Crawford. December 6, 2005. Newspapers, television and radio stations around the world reported that Sunday's turnout for the pro-democracy march in Hong Kong had renewed pressure on Beijing to reform the city's political system. Most international television and radio stations, newspapers and websites went with the organisers' turnout figure of 250,000, while the police and independent groups gave considerably lower estimates. (Apple Daily) December 5, 2005. The organizing units said that more than 250,000 participated in the march, but the police estimated that the number of marchers was 630,000. A research team of Hong Kong University students and the Local Bright Young Things organization had separate estimates of 81,000-98,000 and at least 150,000 on the street yesterday on behalf of universal suffrage. (Sing Tao) The Numbers Diverge; Scholar: 60,000 to 80,000. December 5, 2005. The Civil Human Rights Front announced the number yesterday to be 250,000 through counting, but they declined to explain their method of calculation. According to spokesperson Lee Cheuk-Yan, they use a "head-count" at five locations: Victoria Park in Causeway Bay, Moreton Terrace, Sogo Department Store, Southorn Playground and Wyndham Street. As for the people who entered or left during the march, Lee Cheuk-yan said that they have a way of calculating them but he declined to explain the method of adjustment because he thinks that the method was too complicated (他就以方法太複雜為由，拒絕解釋進行調整的計算方式). The police said that only 63,000 marched. According to Hong Kong University Department of Statistics & Actuarial Science senior lecturuer Yip Siu-fei, who has counted the number of marchers many times before, the number of marchers was between 60,000 to 80,000. Yesterday, he counted at Percival Street and Admiralty. The method is to count the number of people within a fixed area one minute out of every five minutes and then derive the estimate. By Yip's estimate, 64,000 people passed by Percival Street and 70,500 people passed by Admiralty. He said that in order to achieve the 250,000 announced by the organizers, there has to be 1,800 persons going through each minute. But the largest number of persons per minutes was only 700 (between 6:15pm and 6:45pm) and therefore there is almost no likelihood that the organizers' number can be true. (Ming Pao) December 5, 2005. (in translation) Our newspaper commissioned Thomas Lee, who is a guest lecturer at the Hong Kong Polytechnic University in satellite geographical positioning applications as well as the managing director of Starvision Limited Company, to use space technology satellite photo analysis. Based upon the photographs taken by our photographer high above from the building across Hennessy Centre, the analysis found 92,000 persons in the march. According to Thomas Lee, the software analysis of the Wanchai marchers showed that there is approximately 100 persons for each 100 square meters. If the entire road has 72,000 square meters so that there would be 72,000 persons at 3:30pm. On the basis of 1 hour 45 minutes (105 minutes), then there would be 1.28 trips made over the 2 hours and 15 minutes duration. Therefore, it is estimated that the number of marchers is 92,000 (not including those who joined in the middle of the march). (in translation) Hong Kong University Department of Statistics and Actuarial Science Senior Lecturer Yip Siu-fei leads the Project To Count Demonstration Marchers. Yesterday, more than a dozen statisticians were sent out in three teams. The first two teams (each team has 3 people) were stationed at the pedestrian bridges over Percival Street in Causeway Bay and Pacific Plaza in Admiralty. For every five minutes, they counted the number of people going past that point in one of those methods and then they estimated the number of people who passed through that point through the march. The third team of statisticians interviewed random marchers at Admiralty to see if they "had gone through Causeway Bay during the march." This allowed them to estimate the number of people who joined the march. According to Yip Siu-fei, the statisticians counted 64,000 persons at Causeway Bay. At Admiralty, they counted 70,000. 12% of the marchers joined midway. Therefore, the number of marchers equals: (the number counted at Wanchai + (the number who passed through Admiralty x the fraction who joined the march midway)) = (64,000 + (70,000 x 0.12)) = 72,400. (The Standard) Turnout is Substantial However One Cuts It. By Andrea Chiu. December 5, 2005. It is perhaps a case of "seeing is believing" when it comes to estimates of the turnout for the march. Estimates ranged from the organizers' 250,000 to the police figure of 63,000. The director of the Hong Kong Transition Project at Baptist University, Michael DeGolyer, said his "very conservative" estimate was between 70,000 and 75,000 but that there were 100,000 or more in a "rough count" if he included people who joined or left the march along the way. DeGolyer said he watched the march for two hours from a Pacific Place walkway above the route. He counted 4,000 marchers every 10 minutes, but added it is difficult to monitor attendance at events of this kind. Both the organizers and police, however, refused to divulge their counting methodology. A spokeswoman for the organizing body, Civil Human Rights Front, said they had 20 volunteers at four different points along the route who counted the marchers. She said they also referred to a research method from Hong Kong University but declined to give further details. The police department spokesman said "we do estimates at every procession" and also use the "same formula," which he did not describe. DeGolyer said he heard the police figures were based on a count of those at Victoria Park at 3.15pm. He said that if that were their basis, the calculation would be inaccurate because many protesters did not join the march at the starting point. Conflicting attendance figures are common at events of this magnitude. Last year, organizers of the July 1 march said 530,000 protested while the police counted 200,000. In 2003, organizers said there were 500,000 but the police said there were only 350,000. "I think in terms of a demonstration for one issue - democracy - it was a pretty substantial demonstration," DeGolyer said. (South China Morning Post) Six estimates of crowd strength. By Jimmy Cheung. December 5, 2005. Estimates of crowd numbers were compiled, using different methods, by the organisers, police, a University of Hong Kong statistics lecturer, a civic education group and the HKU Public Opinion Programme, which was co-sponsored by the South China Morning Post. HKU's Social Sciences Research Centre will release its figure later this week. The Public Opinion Programme estimate, by leading pollster Robert Chung Ting-yiu, involved six researchers counting protesters as they passed the footbridge at the junction of Hennessy Road and Arsenal Street, Wan Chai. The researchers split into groups of three, with one group counting for a minute starting every second minute and the other group counting for two minutes and starting every second minute. The results were averaged and compiled for a total of 61,123. Adjusting for drop out and those joining in the middle of the march, they estimated the turnout at between 81,000 and 98,000. Civil Human Rights Front deployed 10 counting volunteers at four points along the route. Based on their count the group came up with the figure of 250,000. Police would not elaborate on how they came up with their initial estimate of 40,000 or a later one of 63,000. Paul Yip Siu-fai, senior lecturer of statistics and actuarial sciences at HKU, said his estimate of 72,000 was based on two separate counts, at Causeway Bay and Admiralty, together with a survey of about 400 marchers to adjust the number to account for those who only walked part of the route. A headcount carried out by Local Bright Young Things, a civic education group set up in 1997, estimated at least 150,000 joined the protest. The organisation stationed five teams of counters on Hennessey Road to count the flow every 15 minutes. The Hong Kong University student research team was present all day on the pedestrian bridge at the intersection of the Hennessy Road and Arsensal Road. In simple terms, the team divided the roadway into five different routes and counted the number people every minute and then rested the next minute repeatedly. This gives an estimated number of persons passing through the observtion point. To account for the number of people who either left before or joined after this observation point, the preliminary results are based upon HKU POP surveys between July 3, 2005 to September 29, 2005. Among the 7/1 2005 marchers, 68.9% said that they passed through the Arsenal intersection. Thus, the adjustment factor of 1.33 and 1.60 was derived. When applied to the count of 61,123, the estimated total number of marchers should be 81,000 and 98,000. HKU POP will be conducting interviews later for this specific march. (South China Morning Post) Organisers refuse to split hairs over turnout. By Jimmy Cheung. December 6, 2005. Organisers of Sunday's march yesterday maintained the turnout was so high that there was no point in dwelling on discrepancies in different estimates of the number of people who took part. "Everyone can see for themselves that yesterday's situation is simply overwhelming. Whether it's 250,000 or 100,000, I think justice is in one's heart," said unionist legislator Lee Cheuk-yan, one of the march leaders. His remarks were in response to different estimates by the police and the Public Opinion Programme of the University of Hong Kong. The police put the figure at 63,000, while the Public Opinion Programme gave a range of between 81,000 and 98,000. Separately, Paul Yip Siu-fai, senior lecturer of statistics and actuarial sciences at the University of Hong Kong, gave an estimate of 72,000. The figures were in sharp contrast to the 250,000 claimed by the democrats on Sunday. Legislator Leung Kwok-hung challenged the government to hold a referendum on whether the public wanted universal suffrage. "I think our figure is closer to the truth, he said. "We are tired of arguing about the accuracy of the figures. If numbers are so important, why not have a referendum? That would be the most reliable figure." Margaret Ng Ngoi-yee, of the Article 45 Concern Group, said: "If numbers are so important, tell us how many people the government needs to see on the street before universal suffrage can be introduced, and we will fulfil that." Mr Lee echoed those views, saying: "It's not an academic study. Everyone has his own counting method. But the truth remains. It's a huge crowd." He said he had no plan to ask independent agencies to carry out counts during future marches, saying it was the duty of organisers to give an estimate. (Wen Wei Po) December 6, 2005. There is a dispute over the number of marchers at each demonstration march, and this march against the political reform proposal is no exceptoin. But in reporting this march, most of the major newspapers including Ming Pao, Sing Tao, South China Morning Post and Economic Daily all asked independent university scholars and public opinion pollsters to estimate the number of marchers. The newspapers quoted three different statistical studies which say that the number of marchers is definitely not more than 100,000. This shows that the opposition's "250,000 in the march" is absurd beyond the point of "diluting with water or cheating on the weighing scale (摻水呃秤)." Therefore, with the exception of Apple Daily, almost none of the newspapers put the opposition's "250,000 persons" into the headline. 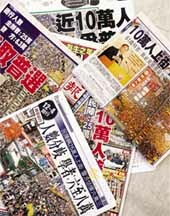 Some even wrote articles to question whether the opposition was "exaggerating (報大數)." 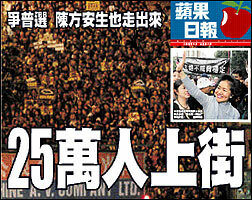 Ming Pao's front page was about this march, but it did not use either the 250,000 claimed by the opposition or the 63,000 published by the police in the headline. They used as their sources Hong Kong University Statistics and Actuarial Science Department's Yip Sui-fei and Polytechnic University Satellite GPS application guest lecturer and Starvision managine director Thomas Lee who found 72,000 and 92,000 respectively. Therefore they used "Nearly 100,000 fight for universal suffrage" as the headline on the number of marchers. 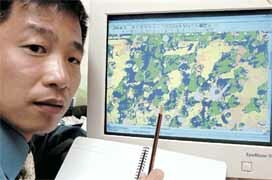 Ming Pao also had an article titled "Satellite Photo Analysis Found 92,000" to explain in deatil the two research methodologies and they also quoted Chinese University of Hong Kong Sociology Department associate professor Chen Kin-man who said that the 250,000 "head count" from the opposition "did not have a rigorous method of calculation, and therefore its trustworthiness is low." Sing Tao's headline was "Civil Human Rights claim 250,000; police said 63,000; the numbers diverge; scholar: 60,000 to 80,000" They quoted the count directed by Yip Siu-fei, including a description of methodology as well as other university opinion polls. They quesioned the trustworthiness of the opposition's "250,000." They also had a special article titled "The Civil Human Rights Front exaggerates; the government shuts up in order not to look petty" to express their displeasure. Hong Kong Economic Daily News quoted Yip Siu-fei as well as the HKU-POP research team, and the number used in the headline was "100,000 people in the street." But the news report said that the total number of marchers should be between 81,000 and 98,000. The English-language South China Morning Post did not use the number of marchers in its headline. It only cited the results of the HKU-POP results within its report, and said that the number of marchers should be around 80,000. The New Journal used "100,000 people marched" in its headline, and quoted "informed sources" who said, "According to the accurate study by many organizations, the number of marchers is not more than 100,000." Sing Pao used both the opposition and police figures in the headline, and did not make any special analysis. Among all the Hong Kong newspapers, only Apple Daily used the opposition's 250,000 as the front page headline to highlight the opposition's exaggerated number. 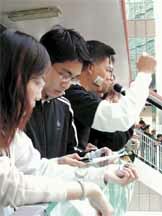 (Apple Daily) December 6, 2005. Pan-democratic person in charge of counting, Lee Cheuk-yaun said that the organizers send out ten people to count at five different locations. He emphasized that "justice in people's hears and everybody has the eyes to see." (Ming Pao) December 6, 2005. The organizing unit announced on that day that the number of marchers was 250,000. A member of the organizers Lee Cheuk-yan responded yesterday that they only found ten volunteers to count people and then made some adjustments to the number of people who joined or left midway. He emphasized that their count is not a meticulous scientific study. But no matter what the number of people is, the fact is that many people were in the streets but Donald Tsang did not respond to the demands of the citizens. (Sing Tao print edition; see also Ta Kung Po, Ming Pao and Apple Daily) December 9, 2005. Hong Kong University Faculty of Social Sciences' Social Sciences Research Center made a video recording of the march on 12/4. After doing a count from the video recording, the number of marchers was esimated to be between 57,000 and 61,000. Director John Bacon-Shone said that 61,000 is a "verifiable number" and was the result of repeated counting. About this, the march commander-in-chief Lee Cheuk-yan said that the number was "not credible," and believes that the Civil Human Rights Front "must be able to count better than him." Hong Kong University Faculty of Social Sciences' Social Sciences Research Center counted the number of marchers on 12/4 to be between 57,000 and 61,000. The Center director John Bacon-Shone said that they installed a video cameras on the pedestrian bridge on Hennessy Road in Wanchai and recorded the marchers between 4:20pm to 6:50pm. The researchers then sampled four seconds out of every 30 seconds and counted the total number of marchers included in the video image segment. Based upon this method, the researchers drew 120 samples per hour and the average number of persons per hour was 24,000. From this, they calculated the total number of persons over the course was 2-1/2 hours. John Bacon-Shone acknowledges that they have made no adjustments to the number of people who left before or entered after Wanchai, and therefore there is a downward bias. John Bacon-Shone declined to say which of the estimates out there was more credible. He emphasized that his team wanted to to "offer an accurate and verifiable method of calculation" and they had repeatedly reviewed the videotape, at least twice and as many as four times, in order to get the right count. By comparison, all the other organizations relied on the human eye to count at the scene and there may be errors. For this, Lee Cheuk-yan responded that the 61,000 number is not credible. He pointed out that he was confident that "we can count better than them." As to the flow of release of different estimates of the number of marchers, Lee Cheuk-yan is not concerned that this would affect trust in the Civil Human Rights Front. "It may discredit those scholars."